Millions of people across the nation tune in every weeknight to watch “Wheel of Fortune,” one of the longest-running game shows in U.S. history. Locals were especially glued to the TV on Tuesday, Feb. 16, to watch Sully native Jeremy Van Soelen and his wife Melanie take on the famous wheel and test their puzzle-solving abilities. The two Fargo, ND, teachers filmed the episode on Jan. 7 in Culver City, CA, and have kept the results of the show top secret for over a month. 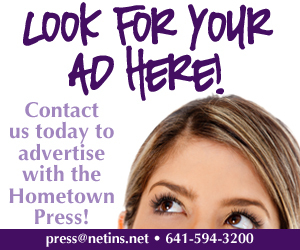 After the show aired on Feb. 16, the Van Soelens are thrilled to share their excitement of not only making it on the show, but advancing to the final round and bringing home $20,223 in cash and prizes. 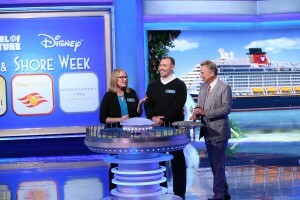 Melanie and Jer with “Wheel of Fortune” host Pat Sajak in the bonus round. 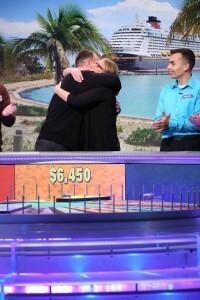 The couple was unable to solve the bonus round puzzle of "Heroic Journey," which would have added $33,000 to their winnings of $20,223 worth of cash and prizes, including a Caribbean cruise. Back on Jan. 7 for the taping of the show, the couple arrived at Sony Studios bright and early, where they spent the entire morning on the “Jeopardy” set going over rules, signing forms, and getting hair and make-up done. The contestants were treated well on the set and were given breakfast, lunch, and beverages and pizza in the contestant room during filming. After taking care of legal matters and getting pampered by the hair and make-up team, the Van Soelens made their way to the “Wheel of Fortune” set to practice spinning the 2,400-pound wheel and calling letters. The couple was surprised to see the set was smaller than expected, with numerous screens to pay attention to. Jer and Mel on "Wheel of Fortune." With his game face on for the actual competition and filming, Jer stuck to the couple’s original plan of him spinning the wheel and Mel calling out the letters. Their first spin? Bankrupt! It’s a good thing their luck turned after the first few puzzles as Jer admits to getting frustrated. Jer and Melanie celebrate their success in a "Wheel of Fortune" round. Soon, the couple found themselves on the up and up on the puzzle-solving game show. Jer and Melanie solved the Prize Puzzle with the winning guess of “Onboard Activities.” During that round, Jer and Melanie brought in approximately $6,500 in cash and a Caribbean cruise valued at $11,500. Another solved puzzle of “Roasted Cauliflower” added the house minimum of $2,000 to the couple’s tally, and soon the couple found themselves heading to the coveted final round. Unfortunately, the bonus-round puzzle of “Heroic Journey” stumped the two teachers, a prize that would have been worth an additional $33,000. “Obviously, that is a little disappointing, but we definitely have not dwelled on that,” said Jer. Even though the show was filmed over a month ago, the Feb. 16 air date was the first time Jer and Melanie were able to view the episode themselves. “A lot of the experience was kind of a blur so we are excited to ‘relive’ it,” said Jer. The couple hoped to host a watch party for their game show television debut on Feb. 16, but reality called and instead the two teachers at Carl Ben Eielson Middle School were in the middle of student-teacher conferences while the rest of the country tuned into “Wheel of Fortune.” The couple settled for watching their episode on DVR with their four-year-old son Jackson and are thrilled to be able to finally share the results with family and friends, including Jer’s parents, former Sully residents Scott and Gayla Van Soelen now of Grinnell. 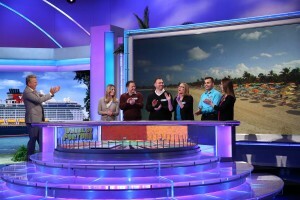 After more than a month of keeping their “Wheel of Fortune” success a secret, Jer and Melanie are happy to be planning their summer Caribbean cruise, which helps take the sting out of having to file taxes in California this year due to their winnings. However, the obligations that go along with winning is something they will gladly take care of and quickly forget as part of the memorable experience that will fondly be remembered for quite some time.